This project is addressing several CERF life-saving criteria for affected people including the provision of transitional shelters, essential Non Food Items (NFIs), repair of wells and toilets and cleaning of canals. 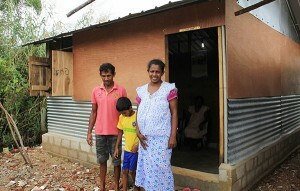 In Gampaha district, 74 families are being provided transitional shelters. Mrs. Swarnakanthi’s family from Nilsirgama village was provided with a shelter as their home had been badly damaged by the floods. Nilsirigama is a Grama Niladhari division in Wattala DS division in Gampaha district consisting of 300 families. It is surrounded by marshy land and several waterways including the Ja-ela canal and Dandugama river. The flooding had affected 300 families, nearly 1,200 people, in the village. Many of the flood affected families lived in temporary relief camps and in schools and churches until the flood waters subsided. Despite the dangers of the flood, some male members of families stayed behind to protect their belongings. 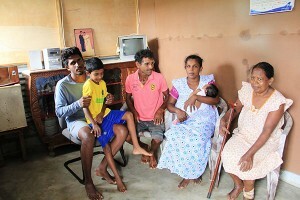 Mrs. Swarnakanthi, her husband, mother and two sons had lived in their house in Nilsirigama GN Division for the past three years. Their house is located in a marshy area with several canals located nearby. Their house, constructed mainly with planks, could not withstand the intensity of the flood. The house was flooded with four feet of water and many of their belongings including clothes were destroyed. The narrow pathway to the house was also completely inundated by the floods making access dangerous, especially for Swarnakanthi who was 4 months pregnant at the time of the disaster. As the flood had made their home uninhabitable, the family moved to a relief camp in Colombo. When UN-Habitat commenced project activities in the area, Mrs. Swarnakanthi and her husband Ivone Priyantha were selected for assistance as they had no financial resources to rebuild their flood damaged home. The construction of the shelter commenced in October 2016 and took just four days to complete. As Ivone Priyantha is a mason by profession, he took personal responsibility for the construction of the transitional shelter. 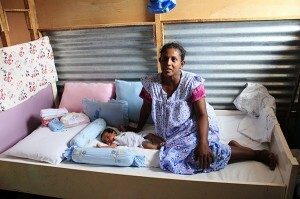 Their new home has been constructed with a mix of cement blocks for walls and tin sheets and plywood boards. Zinc Aluminium sheets have been used for the roof. The floor has been rendered with cement. The shelter is 200 square feet and consists of a living room and bedroom. The family is using their old shelter to cook meals and store goods. The toilet, which has also been repaired with funding from the project, is located outdoors and their bathroom is a tap in the back garden. Swarnakanthi is very happy to be sheltered from the elements. “I am so happy because I have been given two beautiful gifts at the same time – our new baby and our new home. I want to thank all of you. Because of this project, our family has been re-united. My eldest son was living in my sister’s house for a long time as we didn’t have enough space in our old house. When I see my family sleeping peacefully at night, I am so happy. Thanks to this project, my husband was given the opportunity to build our house, and now he gets an income undertaking masonry work to build other shelters.” she said. Ivone Priyantha is now engaged in constructing transitional shelters for other families in the surrounding area through the project. The CERF project is being implemented by UN-Habitat in the districts of Colombo and Gampaha from June 2016 – February 2017. The project aims to assist 130 families with transitional shelters. Overall, 85,500 people will benefit from this project through numerous interventions including repair of wells and toilets, NFIs and canal cleaning. UN-Habitat is implementing this project in close collaboration with the Government of Sri Lanka and several partners – the Rural Development Foundation (RDF), the Sri Lanka Red Cross Society (SLRC) and Sri Lanka Land Reclamation & Development Corporation (SLLR&DC).